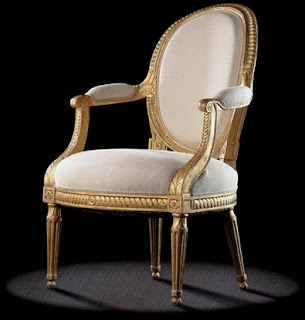 This rare Armchair Gilded 24 Carat Gold Leaf , it is from the master of the Rue de Clery (under the sign "au Poirier") is a very well-balanced example of the early Louis XVI style. 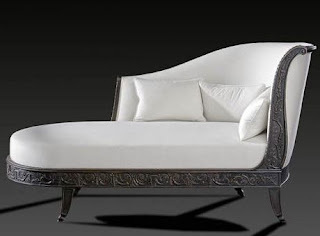 The arm rests are still of Louis XV design, and the intentionally sometimes lightweight carving by one of the greatest enthusiasts of Greek-style formalism. Traceries, piastres, rosettes, acanthus leaves, water lilies, raies de cœur form carvings which are very happily arranged (even on the reverse of the back rail). 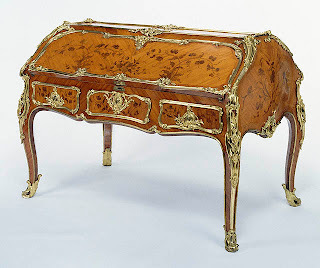 Also note the foliage leg ends, the attachment of the arm rest to the back, the carving at the top of the back and on the ends of the arm rests. The seats by these masters are in the Louvre.